We had a real feast of crab last night. Our neighbours, Barb and Clif brought me over five large Dungeness crab already cleaned and ready for me cook. I made Roasted Garlic and Black Pepper crab. A simple recipe that is amazingly good. We ate outside on their deck. Sat the roasting pan right on the table and everyone just helped themselves. Served with fresh corn and chilled white wine. Perfect summer evening. 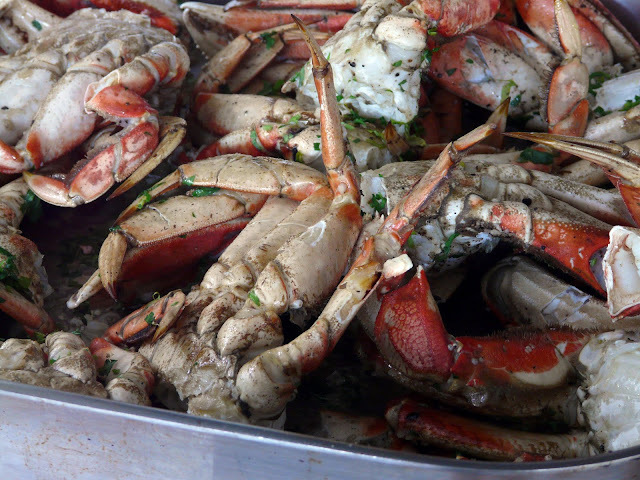 Dungeness crab should be alive when it goes into the boiling water; the crab has more flavor if you don’t clean it before you cook it. Bring a large pot of salted water to a boil. Put in the live crabs. Cook for 12 minutes. (The crab is only partially cooked because it will be oven-roasted; it takes 15 - 20 minutes, depending on the size, to fully cook Dungeness crab.) Remove the crab from the boiling water, and run it under cold water to cool it down. When the crab is cool enough to handle, remove the back, gills, and guts. With cold running water, carefully rinse off any guts that are sticking to the crab meat. (The crab may be made ahead to this point and refrigerated for 24 hours). Preheat the oven to 500 °F. Break the crab bodies in half down the center. With your hands, carefully remove the legs and claws, leaving the bodies intact. Use your hands to break the bodies in half again (in other words, the full body of each crab is broken into four pieces). Using a nut cracker or lobster cracker, carefully crack open each section of the crab legs and claws; try to keep each leg and claw in one piece. Put the crab in a large roasting pan. Melt the butter. Drizzle the butter and olive oil over the crab, and sprinkle it with minced garlic, salt, and freshly ground black pepper. Thoroughly toss the crab with the other ingredients so that all the pieces of crab are coated. Roast the crab for 10 minutes. Remove from the oven, sprinkle the parsley over the crab and toss again. Return the crab to the oven for 2 minutes. 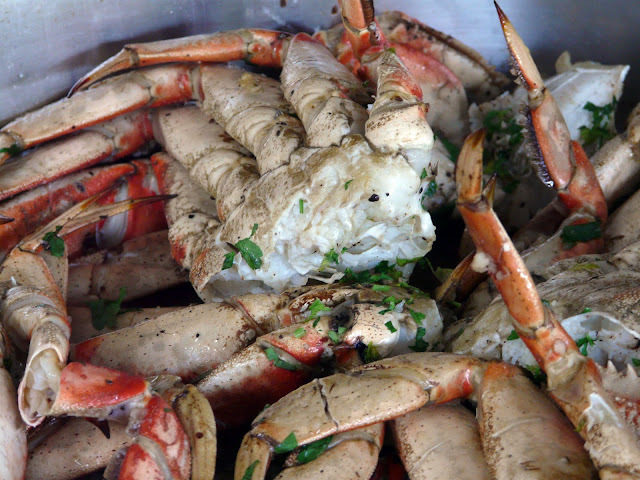 Place the crab on a large serving platter and serve immediately with napkins and an empty bowl for the shells. Oh my, this is my dream dinner. I miss these crabs like crazy!